Looking back over the past months, having begun buying plants for my patio containers mid to late April, I have been looking at which plants were probably my best buy. And I have decided that the sweet potato vine gives me the most bang for my buck. I always pick up both the green and the purple sweet potato vine plants in the spring, as these plants will wilt and die as soon as you get a frost. Just look at this purple specimen. I have cut it back a number of times, and it just keeps springing back full of pretty leaves. Soon the purple sweet potato vine will be producing lavender flowers that somewhat resemble petunias. The chartreuse sweet potato vine is just as exuberant on my patio. There are other sweet potato vines, but these two are the only ones I’ve seen at my local nursery. I have broken off a stem and planted it in another pot and more often than not, I have a new plant growing. So this is a strong energetic plant. If you want to give it a little more encouragement, roll the end of your stem cutting in cinnamon powder. This will give it a boost and act as a rooting hormone. I paid around $3 for each of my two sweet potato vine plants, and I feel that I more than get my money’s worth with these beautiful plants. Year after year. They say full sun is ideal for the sweet potato vine, but I’ve found that around noon the leaves start drooping, so I will give them a spray from the hose to cool them down. So I think it just depends on your particular climate. Furthermore, I have moved the purple sweet potato vine to a location that gets afternoon shade, and it thrives there. So I think they appreciate part shade in hot regions. You want well-draining moist soil for this plant. If the ground is soggy for too long the root system can develop rot, which can kill it. This applies to both container plants and in-ground plants. I have not found fertilizing to be necessary with the sweet potato vine. If you’ve used well-balanced soil, your plant will probably be as prolific as mine is. Moderate watering. Keep the soil moist, but not wet or soggy. Sweet potato vines spread rapidly, so regular pruning is required. The plants grow rapidly in the spring and summer months when the weather is warm. If you are trying to train your vines to spread and create a thicker ground cover, trim just above a place where there’s a pair of leaves. This will encourage the vine to split in two at the leaf buds. I love my sweet potato vines too. They are growing like gang busters. They are such a pretty green leaf fill for any potted plants. I have mine in my flower boxes and they are down to the ground and still on the move. I forgot to mention that sweet potato vine is a great filler. In fact it’s such a great filler that it has covered up the rest of the plants in the pot. You can grow sweet potatoes plants from tuber, just cut one in pieces and put in a big pot. At the end of the season dig soil and get sweet potatoes. Leave vine intact . Next year vine will grow and you can get some more. You can eat them after washing and either boiling or roasting or candied. I love sweet potato vines also! I wonder how they would do in the house? Perhaps you could root a piece of each and see if you can overwinter them indoors? I, too, am a sweet potato vine fan. Mine also wilt a bit in the morning sun, and then are bright and happy again when they get a bit of shade in the afternoon. The funniest thing is the past 3 years, when I am emptying their containers in the Fall, I have had several sweet potatoes growing in the dirt. Bonus! I have added them to my compost, and never tried them to see if they are good to eat, but it has been fun finding them the past few years!! Hm. That’s never happened to me. I wonder why? Your patio looks beautiful! 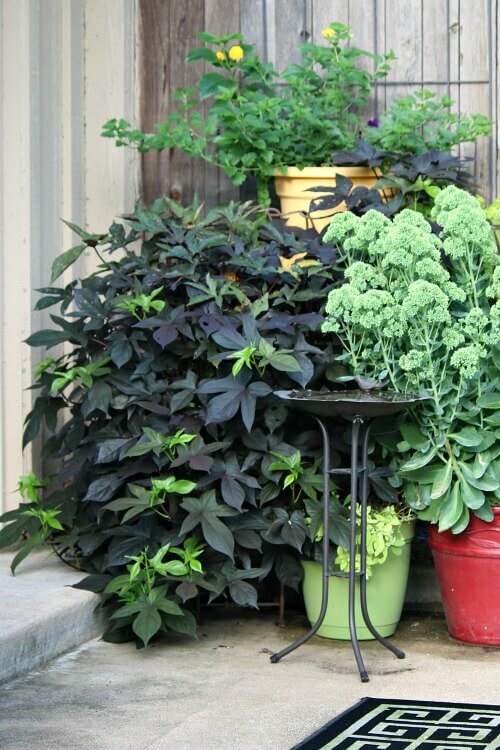 I too love sweet potato vines and think they look fabulous alone or mixed with other plants. I also had great luck the last 2 years with ferns, which I got for $12.99. One is supposed to get to be 6 feet across and they can be brought indoors for the winter. I might do that but I have noticed that the grasshoppers like the fern and I am afraid of them coming in the house as I hate bugs. I hope your eye is feeling great! Have a wonderful day! Wow, that’s a big fern! I hate it when grasshoppers get inside and I can’t grab them while they’re hopping. Thanks for the interesting info Brenda bc I’m trying to learn more about plants. I love purple sweet potatoes too and they are good for you. Have a great day! Well, this is the place to learn. If I don’t know it, you can be sure someone in the comments will have the answer you seek! I love your sweet potato vines. If I should do spring flowers in 2019, I will definitely get those. Your patio is still as pretty as ever. 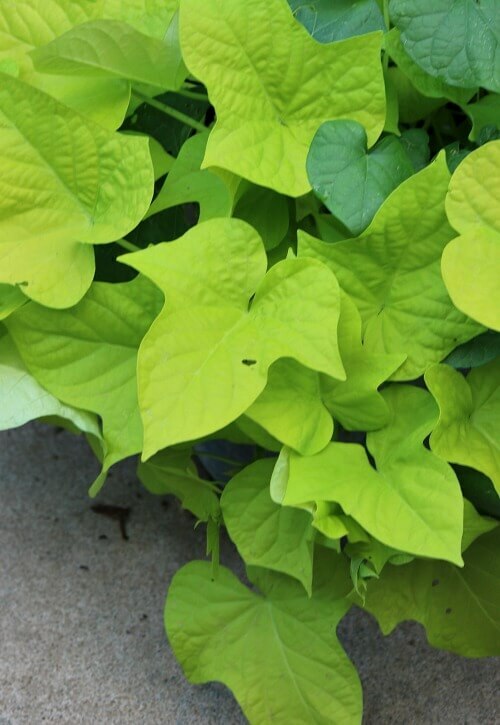 You will love sweet potato vine, Carol and Molly! They far exceed expectations. I don’t have any sweet potato vines this year, but I have in past years. Yes, it grows prolifically and looks lovely spilling out of containers. Mine is trailing across the cement. I keep snipping it, but it’s hard keeping up with it. Lovely vines! Thank you for the growing tips. I got a cutting from my Mom’s plant and it rooted quickly. Loving the chartreuse color. Next year I must have purple, too. I wonder if they can be trained on an arbor? I really love your hibiscus. I saw that variety at my nursery but the price of $24.99 was too high for me! The dark foliage is exquisite and such flamboyant blooms! I am not having luck with creeping jenny. Any tips for keeping it green! Mine tends to go brown in places. I get morning sun then all shade in my container garden. Standouts have been calladiums this year (my 1st time to try them). I recently bought a black and blue salvia, which would love all the sunshine you get. I highly recommend it, as the flowers are bright blue with dark calyxes. Stunning contrasts are so enjoyable. Creeping Jenny, mine anyway, gets brown in the sun. I don’t think it likes intense heat and probably needs to be in part shade. 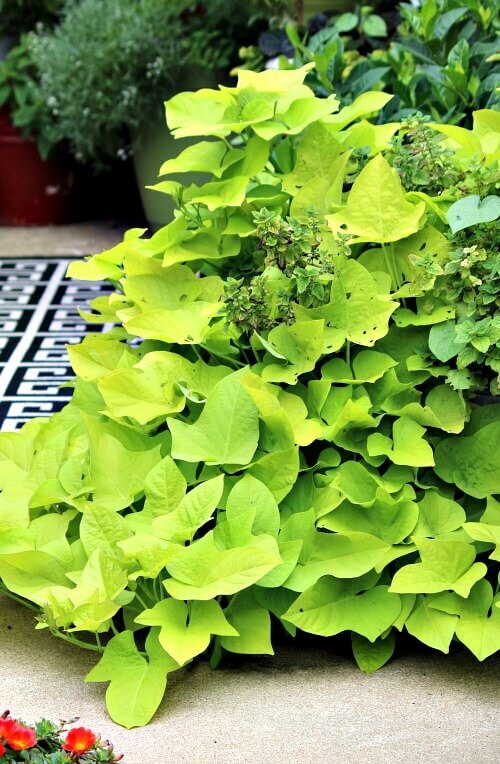 I Googled it: Creeping Jenny leaves will be a different color based on the sun exposure: golden yellow in full sun and chartreuse green in partial shade. I grew a sweet potato vine from an actual sweet potato once. It was the chartreuse color and got quite big. Then I somehow forgot to water it for too long and it croaked. I actually grew it in water. 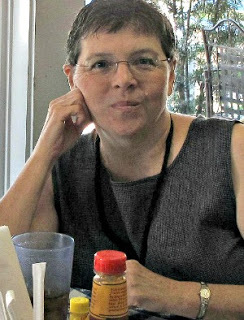 I might try growing one again for next spring. Yours are so full and beautiful. You could probably winter over a cutting or three and then they would be even cheaper than the $3. ones! Hope your eye is doing well and your week is off to a good start. I might think of doing that. I agree, the sweet potatoe vines are wonderful plants! I’ve never seen any plant get so lush and full.